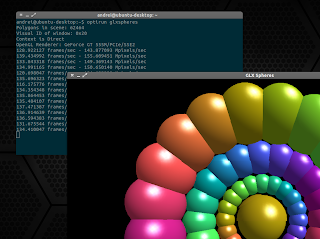 Bumblebee 3.1 has been released today with support for Primus as an alternative to the VirtualGL optirun backend, along with other enhancements and fixes. For the complete Bumblebee 3.1 release notes, see THIS page. Bumblebee isn't useful just for those who want to use the Nvidia graphics card for gaming, but also to improve battery life because by default, Bumblebee disables the Nvidia card which is always turned on unless you disable it some other way. To use the Nvidia card for an application or game, you can launch it with "optirun" (e.g. : "optirun firefox"). Update: initially, Bumblebee 3.1 was only available in the testing PPA, but it's now available in the stable Bumblebee PPA. Once installed, log out and log back in, then try it out by running "optirun glxspheres". You may need to edit the Bumblebee configuration file if you're not using nvidia-current (/etc/bumblebee/bumblebee.conf). Primus is now available in the Bumblebee Stable PPA. However, please note that if you were using the Primus PPA and want to only use the packages in the Bumblebee PPA, you'll have to purge primus ("sudo apt-get purge primus*") before installing Primus from the Bumblebee PPA. For other Linux distributions, see the Bumblebee installation page or get the code via GitHub. If you encounter issues with Bumblebee, report them @ GitHub.